How I love Valentine’s Day! Like really love. And I’m sure that’s part because my birthday is Valentine’s Eve, but it’s also because it’s a day to celebrate love–romantic, platonic, familial, whatever–just love. And I think that’s beautiful. Period. 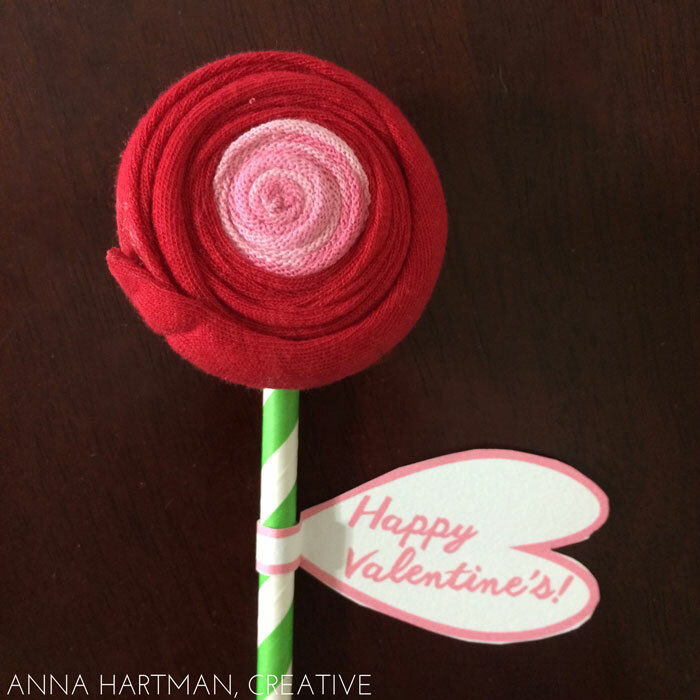 With my passion for February 14th, comes my love for hand-made Valentines. 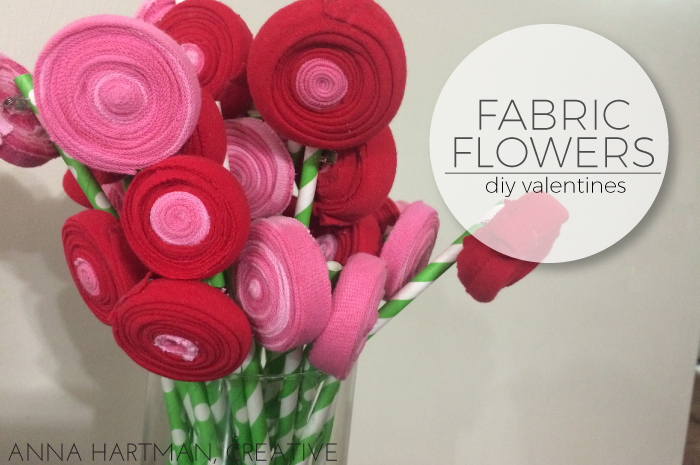 These fabric flowers might be my favorite Valentine ever. Simple materials, simple process, big smile factor. 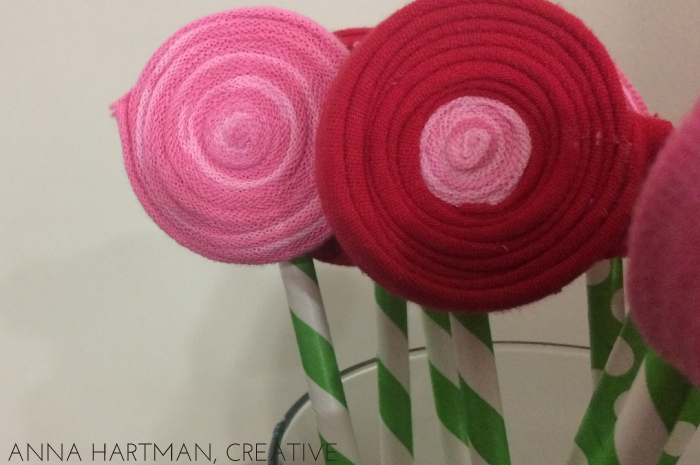 They’re prefect for your kids to help you make and then to give their friends at school. Or you could make up a bouquet to give your love because there’s something extra special about flowers that won’t ever wilt. Start by cutting a long, narrow strip of fabric. The longer your fabric strip the bigger your flower will be. My strips were about 3 feet long and up to 1 inch wide. Fold each strip in half long ways, so it’s about .5″ wide. Start at one end, and roll the fabric tightly. When you reach the end of your fabric strip, use the E6000 to glue the end to the body of the flower. You might want to use a rubber band to hold the end in place while it dries. The glue will start to set in about 3 minutes, and it dries clear so you can drip without consequence. If you want multi-colored flower, then make a small fabric whoorl, glue it, then glue another color around the small roll until your flower is the size you want it. Next, glue the pin back to the back of your flower. Once the pin is secure and all the glue is good and dry, you can pin the flower to the top of a paper straw. You can stop here and make a whole bushel of flowers for your love. But because I wanted these to make perfect valentines for friends at school, I needed a tag to put names on and for my kids to sign. So I made leaves for each flower. My kids wrote quick to and from notes on the back, and I taped them to the straw stems with double sided tape. (I told you this was simple.) And we’re ready for all the Valentine’s parties that this week brings. And because I love all the love, here’s a page so you can print your own page of leaves. Maybe the best part of these flowers is that they double as a Valentine’s Day accessory. The pin can be removed from the straw, and you can put the flower on a chain to wear as a necklace or bracelet. Or pin them to your backpack or dress on the 14th. The possibilities are endless. 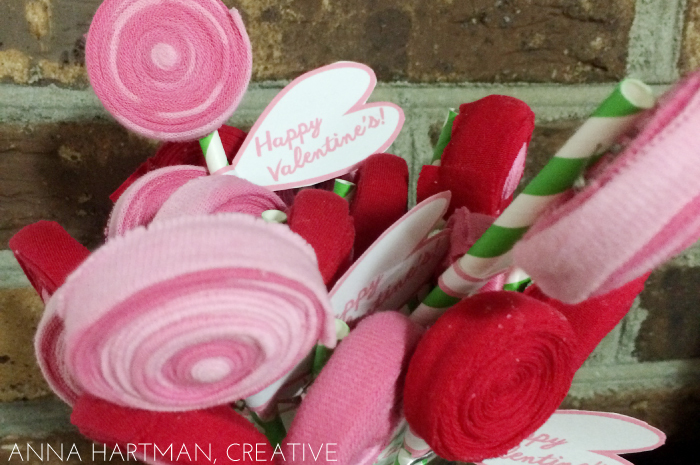 I’ll be wearing one Monday, February 8 on Lowcountry Live when I talk about making these sweet blooms. Tune in to see me in action! How are you showing the love this Valentine’s Day?